Two years is quite a long time for me to keep a computer, but this Dell has lasted surprisingly well. It lags a bit in the 3D graphics department, but CPU wise it’s still perfectly acceptable and 4gb of ram is still a decent amount. And the 13″ form factor is perfect for my needs. One of the major advantages of business models is the long product life cycle, which means an ample supply of spare parts and accessories. In the case of the Dell E series the docking stations and some of the other accessories are compatible with all other E series laptops. The greater amount of resources that go into the design and the higher build quality are also apparent – once you’ve had a good business laptop it’s hard to go back to disposable consumer machines! The lack of bluetooth has become an inconvenience as the E4300 is chronically short of USB ports. Two really isn’t enough, and I want to get a bluetooth mouse to free up one of them. I moved to the UK last year and the USA keyboard layout lacks the keys for € and £ symbols. The fan started to buzz loudly now and again about six months ago. It was relatively infrequent and only annoyed me perhaps once a week, but it was a sure sign that the bearings were on the way out. When the fan finally outright stalled I was able to get it to move again after a rest, but I decided it was time to kill 3 pigs with 1 bird and give the old girl a new lease of life. 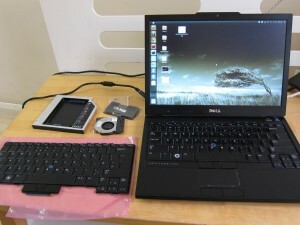 This entry was posted in Articles, IT and tagged dell, e4300, laptop, upgrade on June 6, 2011 by Alex Forbes.